Demonstrators march through the St. Louis Galleria on Saturday evening as they continue protests against the acquittal of Jason Stockley and police violence against black people. Cori Bush addresses shoppers, explaining why protesters are at the mall and encouraging them to join in. LaShell Eikerenkoetter raises a fist while livestreaming the protest at the St. Louis Galleria. State Rep. Bruce Franks Jr. leads a chant inside the St. Louis Galleria. Demonstrators gather at the St. Louis Galleria, where police arrested several protesters a week earlier. Rasheen Aldridge watches as shoppers descend an escaltor to join the protest. Demonstrators stand where police arrested several protesters a week earlier at the St. Louis Galleria. Workers watch protesters from inside a store at the St. Louis Galleria. Police officers stand by as protesters march through the St. Louis Galleria. Protesters walk out of the St. Louis Galleria, toward Brentwood Blvd. and Galleria Parkway. Protesters stand at the intersection of Brentwood Blvd. and Galleria Parkway. Raven Harris, 18, was at the St. Louis Galleria when she saw the protest and decided to join in. LaShell Eikerenkoetter raises a fist while livestreaming the protest outside the St. Louis Galleria. Shoppers who joined protesters pose for a photo outside the St. Louis Galleria following the action. A week after St. Louis County police arrested 22 people following a peaceful demonstration at the Galleria mall, protesters returned to the shopping center in a short and tightly executed display of resistance they vowed to continue. Dozens of protesters went to the mall at about 6 p.m. to let police, business leaders and others know that they would not be deterred in their fight to end police violence against black people. They gained a diverse group of followers inside the mall before heading to the intersection of Brentwood Boulevard and Galleria Parkway. The latest demonstration at the mall came one day after St. Louis police ended a peaceful three-hour protest near Busch Stadium with force. St. Louis officers arrested the Rev. Darryl Gray after spraying him with a chemical agent. They shot activist Calvin “Cap” Kennedy with a Taser and also sprayed him with a chemical agent. Both men were released earlier today from the St. Louis City Justice Center. With the two forceful police responses in mind, those who led the return trip to the Galleria moved quickly to make their presence known and intentions clear. 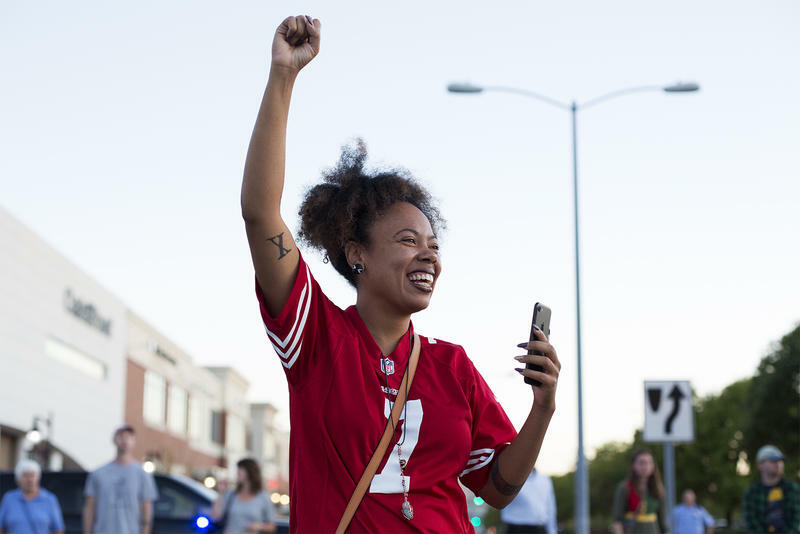 After protesters marched briefly through the mall chanting “Black lives matter” and “If we don’t get it, shut it down!” activist Cori Bush addressed shoppers and onlookers. While the protesters were inside the mall, security personnel and police appeared to stand watching — a sharp contrast to their actions last week, when police made multiple arrests and wrestled some protesters to the floor. That later drew a sharp rebuke from local politicians. Police initially held back during last Saturday’s Galleria protest, but after one protester picked up a trash can that was being used as crowd control and tossed it to the side, officers moved to end the demonstration. The Richmond Heights and St. Louis County Police Departments said they arrested people last week after mall officials asked them to remove protesters. Some members of the St. Louis County Council said this week that they want an outside agency to investigate how police handled the protests at the mall, and state Rep. Stacey Newman, D-Richmond Heights, contended that police used excessive force. There was no such confrontation Saturday. With that, Franks, Bush and other protest leaders led marchers who chanted “we ready; we ready for y’all” through mall parking lots and access roads to Brentwood Boulevard, where police blocked off a stretch of the road in front of the mall. Some protesters said they had shut down the mall and adjoining businesses like The Cheesecake Factory. The protest at the mall is the latest in a nearly daily string of demonstrations that have occurred in the last two weeks. 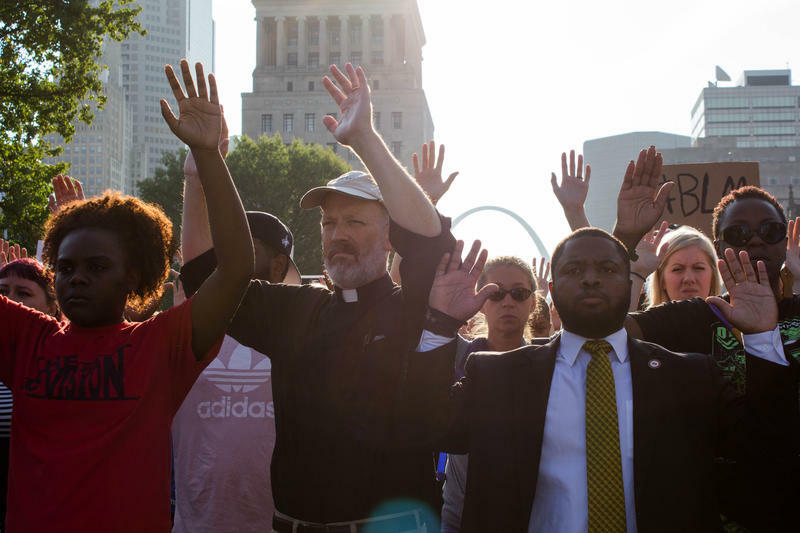 People have taken to the streets since St. Louis Circuit Judge Timothy Wilson found former St. Louis officer Jason Stockley, who is white, not guilty of first-degree murder in the 2011 death of Anthony Lamar Smith, a black man. Some in the crowd said it was important to return to the mall after last week’s arrests to show that they would not be turned back by aggressive police tactics. Franks noted the calm demeanor of police outside the mall. Franks said that’s how the protesters plan to continue their push for change. He also said he hoped the multiracial group of “family” that stood with him in the street would share a unified and unapologetic message that police officers must stop killing black people. Nancy Fowler and Carolina Hidalgo contributed to this report. A three-hour protest late Friday in downtown St. Louis ended in a tense confrontation between police and demonstrators. People in the crowd of protesters said police used chemical agents on some protesters and shot one person with a Taser. Police confirmed they made at least two arrests. 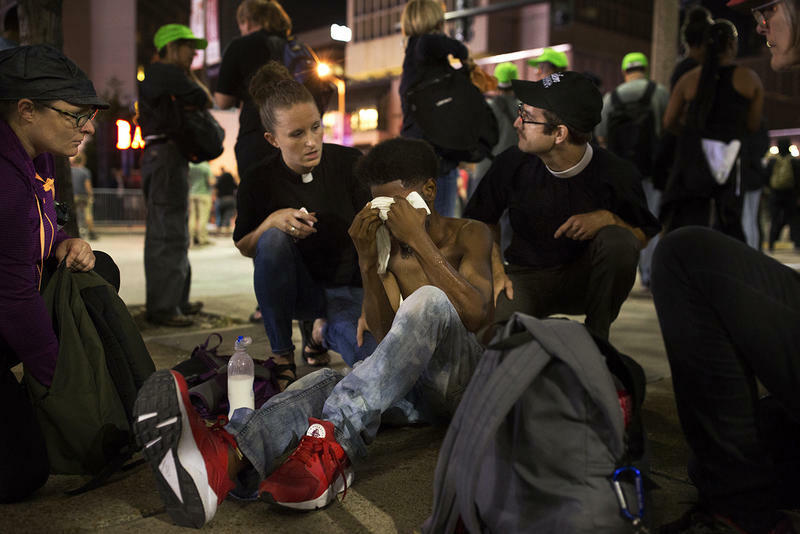 The turmoil followed a night of peaceful demonstrations that took protesters from Kiener Plaza to Busch Stadium, where they chanted at police behind barricades. The protesters demanded that police stop using deadly force on black people. A simple concept underpins the American legal system: equal treatment. But the ideal more often is missed than met — at least that’s what protesters argue during the near-daily demonstrations since the Sept. 15 acquittal of a white former St. Louis police officer in the 2011 shooting death of a black man. The recent events once again have some local attorneys trying to square their faith in a system they’re supposed to respect despite its flaws. Police departments are standing by their officers’ response to protesters after days of civil disobedience throughout the St. Louis region. Although three lawsuits have been filed against the St. Louis Metropolitan Police Department, officials are confident the majority of their officers complied with the department's use-of-force policy, which establishes guidelines, though one area law professor argues those guidelines are up for interpretation. 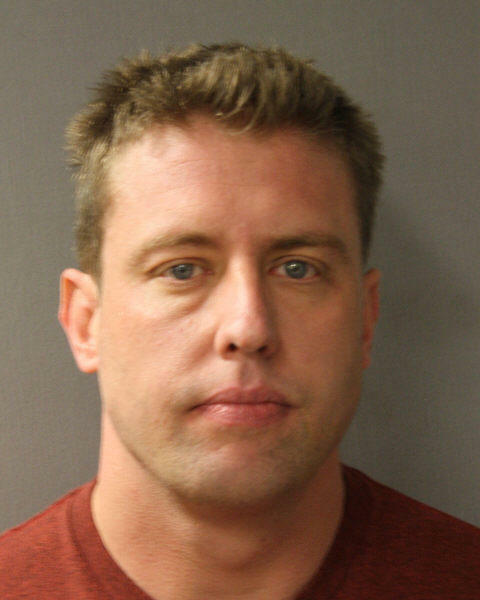 Updated at 9:20 p.m. with the Post-Dispatch interview with Stockley — A former St. Louis Metropolitan Police officer is not guilty of first-degree murder in the 2011 shooting of Anthony Lamar Smith, a judge ruled Friday. "This Court, as the trier of fact, is simply not firmly convinced of defendant's guilt," St. Louis Circuit Judge Timothy Wilson said in his verdict. "Agonizingly, this Court has poured over the evidence again and again." Immediately, protesters, who promised weeks of protests, amassed downtown. The St. Louis chapter of the NAACP called for the Civil Rights Division of the Justice Department to review the case.